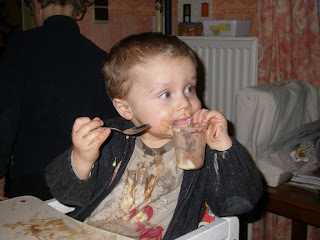 My youngest grandson normally isn't a messy eater. But this time the dessert wasn't easy to eat. He looks so cute in this pic, isn't it? He was all over the vanilla&chocolate cream, we had to unclothe him unto his diaper. We put on his little wellies then and took a pic of him then, while he was mulling on his diaper, it looks like he was excersising for his carrier with the Chippendales. No pic of that here, it's for his privatealbum! The next pic is of a BD card for the yahoolist. Just after everyone send her card to the BDgirl, she is exciled from the list, so I guess I will have one card less on my BD in November. She chose flowers, birds or butterflies as a theme, so I made her this flowers and put a butterfly sticker on it. The third pic is of the Sal with the second cow. Two parts are already done. The lettering was with a lot of French knots, but as the previous cow wasn't having these beasty things in the lettering, I left them out. It looks OK this way too. 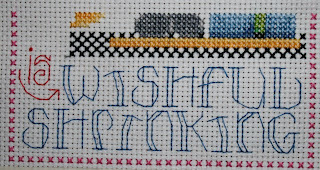 The backstitching I will do the next time. My diet is going well, I lost 6,6 kilos now, this is just a bit more as 1 stone. So this really is a good start. Hubby has pains again, this time from the recovering of the surgery and his arm is swollen from the Lymph fluids. He will have to go to the physiotherapist, but first the wounds have to heal. One day is better than the other, yesterday was really bad. But this time he knows in a while he will be helped and it's not life threatening. His spirits are not high at the moment, but whose are when they are in pain? I hope I can start stitching on the Mystery Sal I am in. I'm behind already one part. And I got the first part of the Spring Sal, so I better go now and stitch! Edith, I'm sorry that this happened in your birthday card round. I have been there, too. 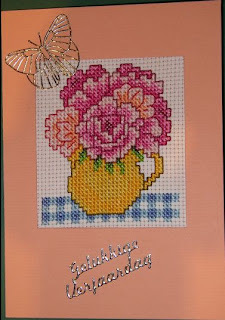 Let's hope that the other stitchers stay in the group after receiving their cards. The card you stitched is very nice. You do know, don't you dear friend, I was in other Round Robins that I never got back. It's a terrible thing when these things happen. And about your darling hubby, I pray he will recover fully. I empathize completely when it comes to health difficulties, with more than my share, too. HUGS from Canada! I LOVE YOU!